Great news sbm! I am pleased for you. > KTM SM950 is for sale, as I’m after an adventure bike for more dirt-oriented use. I bought it new in 2008, and have enjoyed 6 years of trouble free, fun riding. >Nothing to be done to her, 7 months rego, just buy & ride off into the sunset. I reckon a change of tyres would likely meet your new need unless you have goat-tracks in mind. Thanks ajfclark, I shall be studying how you did that closely! Hmmm, how about Honda DRIVERS? - scored a great second hand CRV that is doing us just fine - it's even got a camping table built into the boot!! >doing us just fine - it's even got a camping table built into the boot!! What about them? They are cages aren't they? ~> I may be up your way come Sept.
~> ~> Save an aid climb for me! M9 - I just pulled the ad. Couldn't do it. Got quite excited about shiny new pretenders, and then took my bike out for a long ride - and I just can't let her go. She would sell for about $7500, and I can't think of another bike I'd prefer at $12,000. So we've kissed and made up, and I've promised to buy her lots of shiny things, and we are embarking on a second honeymoon. I came around to your view on the knobblies, so a set of TKC80s are on order. and if they don't do the trick, I'll probably go the whole hog and have a 19"/17" wheelset made up custom. Meanwhile - she is in at the auto trimmers getting the seat re-shaped (in tasteful ORANGE), I've raised the bars 30mm, Fastway pegs coming (much bigger, and 15mm lower) all of which will make her roomier, and easier for me to stand. Heated grips, new mirrors, a battery tender, centre stand, OEM luggage racks and soft panniers (Wolfman, probably), a bigger foot for the side stand, and a blingy orange replacement for my front brake fluid reservoir which has gone all mottledy-piggledy. Good move keepin' the old bike. It was very high on my list . Consider Mitas tyres i have E-07s on my Tiger they are very good tyre. They work well in the dirt, highway and twisties. Lowering the pegs rather raising the bars is also not bad idea when combine with bar risers. I have Oxford heated grips and they work better than my mate's Beemer ones. Looking forward to the pics. I rate them as 50/50 %ers tar/dirt, and they wear surprisingly well. My last set are 80% shot, and so far I have got 13,500 km out of them. Hangdog, is yours the XC version? One of my best mates has one, and it gets along well, and even better since he fitted E07's! Here he is at last Alpine Rally complete with fishing rod! >M9 - I just pulled the ad. Couldn't do it. I don't think you will regret this action. What we have are classics of their genre, and I see them retaining good value into the future. I am surprised it doesn't already have one. I carry a metal plate for throwing on soft ground to put the sidestand down on. Like Hangdog, I am looking forward to them. Mitas don't make a size to fit. Bike runs 120/70/18 front and 180/55/18 rear rims. The only dualsport tyres that I have found are the Contis. 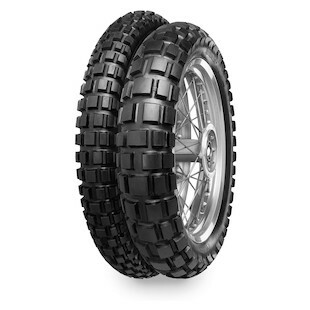 The trail attack is a good 90/10 tyre, I believe, and the TKC80 is the go to for 60/40 road dirt. Picked up my bike from the trimmers yesterday - ooooh very nice - orange seat looks awesome. Now to arrange a 500 km day to test the smiley cheek factor. Pics to follow (or the bike, not the smiley cheeks) when the rest of the bits are on. I am just fitting a Spot Tracker 3 to it right now. Just in case something happens on the big days out. >Yes mine is the Tiger XC. Gets along very nicely even with the 21inch front. >I am just fitting a Spot Tracker 3 to it right now. Just in case something happens on the big days out. Back in '79 I had a Honda 500XLS and it had a 23" front wheel. It was bloody brilliant for all on and (particularly) off road, type usage as far as I was concerned. It would seem that history disagrees with my assessment; otherwise that rim size would be standard fare today? My experience with the early Spot Trackers was a mixed bag affair. Back then they did not always update, and certainly 'dropped' the occasional location reading and this in open country not affected by trees and hills. Hopefully the latest version of same has addressed those problems. >location reading and this in open country not affected by trees and hills. >Hopefully the latest version of same has addressed those problems. Yes i hope so as i bought the latest version because of the improvements and it cost me $165 per year for the service. Back in 2004 + for a few years after, I had similar probs getting serious off-road tread for the KTM, due its wider than standard 18 inch rear. These days I am glad to say that I am spoilt for choice, as manufacturers have jumped aboard the 'adventure' bandwagon. Cross link to another Chockstone (Husqvarna) rider post. Sorry - I meant 120/70/17. Got the TKC80s on - bugger how they ride, they look so butch I'm a bit scared to go near the bike in case it bites. Had a brilliant day yesterday bolting on bits - pannier racks, a bling replacement for my brake fluid reservoir cap (old one was melting, that fluid is evil), a shiny orange extender for the side stand, and grip warmers! Woohoo, no more frozen fingers. Very impressed with myself for making it work first go. Less impressed that the only spare ACC outlet was not switched (the switched one is connected to my GPS) and I'm bound to leave it on one day and drain the battery. Wasn't game to splice in to the switched cable, so I'll leave it until I really piss myself off by stranding myself somewhere, and then do it properly. Photos of the adventurebeast to follow once I go somewhere photogenic. >Had a brilliant day yesterday bolting on bits -(snip), and grip warmers! Woohoo, no more frozen fingers. >to my GPS) and I'm bound to leave it on one day and drain the battery. Wire it into the ignition, & that way it can only be on when the bike is 'on'. You do not want to be in the back of the boonies (no matter how much climbing and bivvy gear you have), if your batt goes flat! On the topic of frozen fingers. Heated handgrips on really cold mornings / evenings, are not enough! There have been times when I have worn silk glove liners + wool glove oliners + usual 'warm' winter gauntlets, ... and after a half hour my fingers can still be cold, even though the palms are sweaty from the heated grips. A good trick is to wrap as much insulation tape as you can fit on the handlebar and still (with difficulty), manage to get the clutch side 'grip' back on, over the heat-items on top of that additional insulation. Marco Simocelli tried to do the same thing and it didn't end well for him. Thanks ajf. It is good to know that luck can go either way, though it too often seems to go the negative way! It is a bit strange that the motorcyclist travelling at speed was so committed to the line, and didn't try evasive action prior the collision; as even if the speed was too great to stop, there was still room to go wide and take the gap on the left of the car. Reminds me of an accident I saw take place in front of me many years ago. I looked ahead at the traffic I was gaining on myself, and noticed second car ahead was slowing with indicator on to turn right into a roadside stop, but had to prop due to oncoming traffic. The timing was such that the bike flashed past my door and found the car in front of me braking heavily, and bike was going too fast to stop with it, so tried to swerve left around it. The rider collided with the rear left corner of car and cartwheeled over the top and further cartwheeled on up the road, with motorcycle doing similar in the table-drain. We all stopped and attended the motorcyclist. It wasn't pretty as he had one leg out at a badly un-natural angle and bone visible. The others seemed competent at first aid, so I went back and turned the motor cycle off, stood it up, and closed its fuel tap. I flagged down other motorists for a bit, so they avoided the mess, and one of them continued on to get help. When I saw mikl's link, I too thought of Marco Simoncelli. The big difference between those two MotoGP rider incidents is that MM didn't have a posse breathing down his tailpipe at the time. Still, there is no denying the young lad sure can ride a motorbike, and it is a shame that history did not throw him and Casey Stoner into the top class at the same time. Marco's helmet coming off reminds me of another accident I arrived at almost immediately after an incident on Pittwater Road, Mona Vale one night. Yellow gook isn't the best to see, and I was pleased when the ghoulies attended and body-bagged him. I am attending (on the bike), the Australian Climbing Festival 17-19 Oct at Katoomba in the blueys. Is anyone interested in making it a group climber-rider-attending affair? I have already booked my 3 day pass - early bird ticket, and will go up on Thursday 16th so as not to miss anything on Friday 17th when it starts. Likewise I will be returning on Monday 20th after it ends. Last time they had camping at the Katoomba Public School oval, but so far this does not seem to be an option for this event. My rider-trip report Blue Mtns Climbing Festival - Escalade '07 to the last event, to maybe stir some enthusiasm?